The satchels are quite traditional and they've got a pared back aesthetic that makes them timeless. Such simple designs appear a bit pedestrian in classic mattes like black, brown, and white, but they feel almost futuristic in the metallics. I think this shiny silver one is my favorite, but it's also available in bronze if you prefer. Each color is available in two different sizes to satisfy girls who love to travel light and the packrats. They've only just hit stores, but those lucky folks in the industry have already been enjoying these satchels for some time. 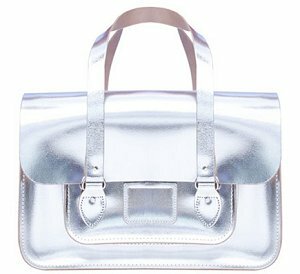 Many lucky stylistas were spotted carrying the bags during London Fashion Week, so perhaps these aren't the purses to carry if you hope to stand out in the crowd. Yes ladies, we may have some It bag contenders on our hands. Prices start at £200, which is quite reasonable for a limited edition line. They're available exclusively through Dover Street Market in London. Hopefully Rei Kawakubo's boutique will add the handbags to its e-store soon to save international fashionistas a trip across the pond!